Two Russian men identified by British police as the perpetrators of a nerve agent attack on British soil insist that they’re innocent. They’ve been accused of acting as Russian intelligence agents and attacking a former double agent in Salisbury, but the two men say that they’re just regular businessmen who work in sports nutrition. They want the “real perpetrators” to be caught and for the British government to issue an apology. Alexander Petrov and Ruslan Boshirov gave an interview today to RT, a Kremlin-financed media outlet that works as a propaganda outlet for the Russian government. British police named the two men as suspects in the Novichok poison attacks of Sergei Skripal, his daughter Yulia Skripal, as well as two bystanders this past March. One of the bystanders later died from the Soviet-era nerve agent after she discovered it in a park disguised in a perfume bottle. Short clips from the interview with Petrov and Boshirov (the British government believes those are fake names) were aired on RT last night around 8:30PM AEST. RT anchors insisted that the full unedited interview would be available on RT.com. As of 12:00AM AEST RT finally posted the entire interview, available on YouTube with English subtitles, however it appears that RT’s video was removed less than three hours later. But we can tell you that based on the livestream the video was not unedited. In fact, it had an RT promo cut into the middle of the interview and then cut out really abruptly as they were speaking mid-sentence. It was really weird. I was watching the livestream and recorded it. You can watch the moment that it cut out here. The interview was conducted by Margarita Simonyan, editor-in-chief of RT and the Kremlin’s top propagandist. 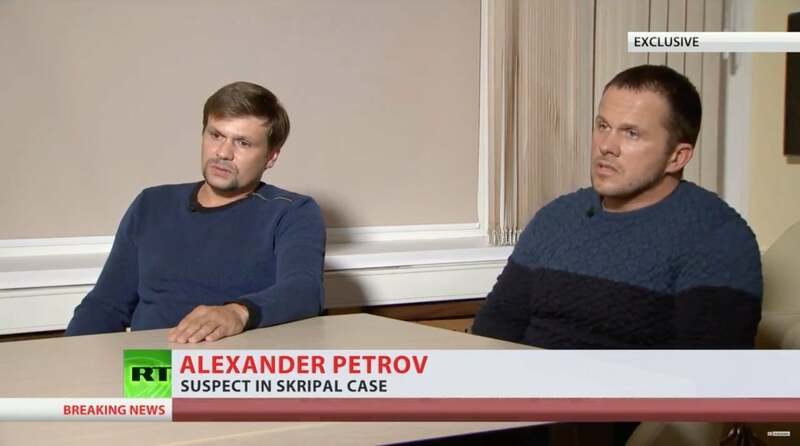 She asked Petrov and Boshirov what they were doing in the UK, and the two men claimed that they were told the small town of Salisbury was just a nice place to visit. “Our friends had been suggesting for a long time that we visit this wonderful town,” Petrov told RT. “Yes, there’s the famous Salisbury cathedral, famous not only in Europe, but in the whole world. It’s famous for it’s 123m spire. It is famous for it’s clock. The one, the first ever created in the world that’s still working,” Boshirov said. The two men say that they can’t leave their homes in Russia any more out of fear that they’ll be recognised on the street. They also declined to name any friends or family to back up their claims that they are who they say they are. According to RT’s website, the men were asked about the perfume bottle that contained the Novichok, discovered by Dawn Sturgess and Charlie Rowley. Sturgess later died after applying what she believed was perfume. The men say that their lives have been “turned upside down” by the allegations and want an apology. The Russian government has repeatedly denied any involvement in the Novichok attack and have floated numerous conspiracy theories about who the “real” perpetrators might be. British politicians immediately called the interview “not credible”. Despite claiming that they were just tourists in Salisbury the two men also say that they go to other places in Europe for their sports nutrition business. When asked about recent trips to Switzerland they said that they were just looking for new innovations. The full unedited interview still hasn’t been published online but the RT anchors addressed the obvious question of why these two men would approach RT, a cable network whose audience is primarily people outside of Russia. The explanation? RT has a large online and social media presence.